Store History | The working bookstore for the reading class. The year was 1939. A gallon of gas cost 10 cents, the top song was “Over the Rainbow,” and Barrett Bookstore opened for business in downtown Stamford. 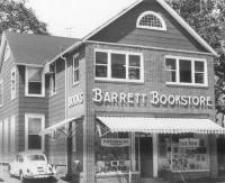 The story of Barrett Bookstore is really the story of small businesses everywhere. The first indication of change for the store occurred in the 1970’s when Stamford’s Town Center was built, taking away most of the foot traffic that had sustained the store in its Summer Street location. David Rose, who owned the store for over 30 years, decided to move to a new location on High Ridge Road in Stamford. Away from the mall, and in a location with easy car access, the business flourished in the 1980’s. During that time, Rose decided to expand and purchased the Book Shelf in Goodwives Shopping Center in Darien. The shopping center was sold and renovated, and soon, rents skyrocketed. Rose decided in 1989 to relocate the Darien store to its current location in Noroton Heights. When Borders moved in virtually next door, the High Ridge Road store was closed. In 1997, the business was sold to the Daleys. Since taking over the business over twenty years ago, the Daleys have twice expanded the store and substantially increased the staff and the inventory. With a strong commitment to customer service, a knowledgeable friendly staff, and a pleasant shopping atmosphere, Barrett Bookstore remains in business thanks to loyal customer support.